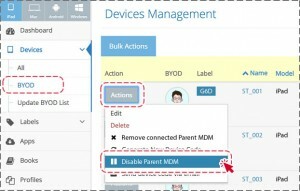 In case that there is a need to STOP the student device from the registered "Parent MDM" app. IT Admin can go to eSchoolPad Admin console to stop the student devices to be managed by any mobile phone. 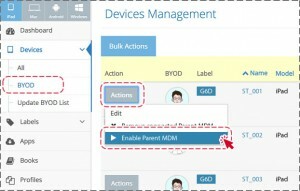 Once the stop action taken, any existing connected "Parent MDM" App MDM feature will stop working on this device. No new device can register to manage this student device any more.